February 19 - Chinese company Hebei Tinsue Floor Technology have been named as the official flooring sponsor for table tennis events at the Nanjing Summer Youth Olympic Games in 2014. The company became the first Chinese sports flooring company to sponsor International Table Tennis Federation (ITTF) events in 2010, and went on to become the official sports floor supplier for table tennis at the London 2012 Olympic Games. "Tinsue is a relatively new player in providing sports flooring sponsorship to the ITTF but are fast becoming one of our key partners", said Steve Dainton, the ITTF marketing director. 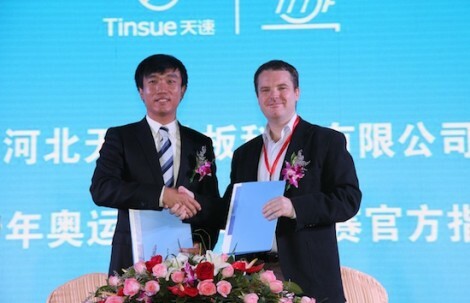 "It is with great pleasure that we announce Tinsue as sponsor of the 2014 Nanjing Youth Olympic Games, namely - official sports floor supplier to the table tennis event." "After an extremely successful London 2012 Olympic Games where both Tinsue and the ITTF built on their relationship, we were very confident that by choosing Tinsue, a Chinese company, for an Olympic event in China, that the event will also be a true success." Tinsue will also sponsor continental events, providing flooring to the African, North American, Latin American and Oceania events for 2013 and 2014. "As well, we are pleased to announce that Tinsue will support for two more years the Continents with marketing agreements with the ITTF, providing sports flooring to the African, North American, Latin American and Oceania events for 2013 and 2014, which shows to prove they are true supporters of table tennis." said Dainton.